P21S Total Auto Wash is German nobility in a spray bottle! P21S Total Auto Wash is German nobility in a spray bottle! This distinctive car wash formula will astound you with superior results. German car care products reflect the same quality and precision that goes into some of the greatest German car designs in the world, including Mercedes-Benz and Porsche. The famed Autobahn freeway has allowed Germans to live life in the fast line, and we guarantee that many of the best cars ever designed, when riding through the Alps and the cities of Germany, are treated with P21S products. Perfected Formula. The powerful detergent and clean scented, citrus solvent make a perfect pair. When I first used P21S Total Car Wash, I was amazed with how fast it works to removes dirt and grime. When it comes to washing, you want to have results and a fresh clean aroma, and P21S Total Car Wash delivers both. Washing Time is Minimal. I’ve scrubbed, you’ve scrubbed…we have all scrubbed the grime and dirt on our cars, sometimes for a lot longer than we want. Gone are the days of scrubbing spots for minutes at a time, as this formula removes dirt and grime with ease. 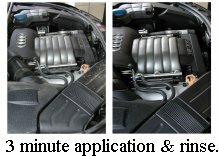 Application and rinsing will take minutes, and you can use P21S Total Car Wash inside your hood to clean your engine as well. Safe and Effective. There is nothing harsh or abrasive within this formula. The detergent is gentle yet powerful on the surface, and the citrus solvent will lift the toughest of grime with one swipe of your sponge or towel. Citrus has long been used in stain removing formulas, and like some household cleaners, you will smell that fresh, clean scent the moment you open the bottle. Convenient Spray Bottle. You won’t need to hurt your back constantly bending over to fill your sponge or towel with car wash detergent. Simply spray and wipe! Q: Max, can I use P21S on my undercarriage as well as my finish? A: I highly recommend you do! The premium formula will leave your undercarriage just as clean as your finish. Also use it under the hood to keep your engine looking pristine. Q: I love ordering car care products from you guys, and I heard this is the best car wash on the market. Can it be used on surfaces other than my vehicle? A: Great question! I have a great answer to it…Yes! P21S Total Car Wash is versatile and doesn’t take a bucket and various sponges and towels to use. Try this car wash on your boat, motorcycle, ATV, and bikes. Anywhere you see grime, simply spray it away! Comes in 1 Liter (33.8 oz.) spray bottle. I am the owner of www.kcdetailing.com and I will gladly give this product 5 stars. P21s Total Auto Wash is extremely effective but is very safe. I have customers that want me to detail their vehicles every week. P21S wheel Gel and Total Auto Wash will not cause damage or dry out plastics or paint. This product will save you a lot of time when you are dealing with heavy tar and sap. Use 1:1 if you need to remove heavy tar and sap. 8:1 for bugs, light tar, wheel wells, and engines. I have been using P21S since 1994 when I worked an after-school job at a specialty shop that carried the product. I have yet to come across anything that cleans with the power of P21S. I always use the Total Auto Wash because it's very versatile and can be used in a number of different applications. It is amazing at removing caked-on brake dust from your wheels and carpet stains. I totally recommend it.